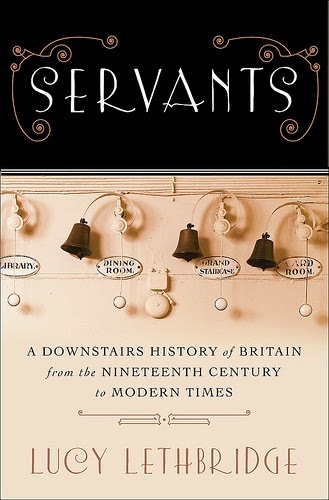 Book Review: "Servants: A Downstairs History of Britain from the Nineteenth Century to Modern Times"
This book offers a fascinating, frustrating history that makes painfully evident the level of social immobility the serving class experienced in Britain -- especially the female serving class. As Lethbridge chronicles, in Victorian England, even philanthropy ultimately existed to keep class divisions in place between domestics and their employers. One example she names is Victorian philanthropist Dr. Thomas Barnardo. In the 1880s, he established a network of children’s homes for street urchins and funneled the children into service as they became of age – particularly the female children, as the demand for male servants was dropping and demand for female domestics was rising. According to Lethbridge, Barnardo’s homes and other servant-focused charities such as MABYS offered “benevolent protection” – and plenty of ideas about “how to distract the working girl from temptation” to socialize with the outside world in pubs, but those ideas were resented by domestic workers in a changing world. Mrs. Miles, a British author who retained servants, once “encountered her housemaid blacking a grate without enthusiasm” and asked her what was the matter. Lethbridge writes, “The maid responded that not only did she hate her work, but she would actually prefer to write books, like Mrs. Miles, adding furthermore that she was always writing and could not wait to get back to her pen and paper. ‘So I tried to show her that it would make her life much happier and easier if she would really excel in the work she had to do … instead of thinking of a life she was not educated for and in which she would probably fail,’” Mrs. Miles said. It seems to me Mrs. Miles’ lecture stemmed not only from the conviction she held about rightful class divisions, but from a primal fear of loss of power and status if her servants became equal to her. What would be stopping them from leaving if they were allowed the full freedoms of the middle class? That fear was founded in reality to some degree, as service was becoming a much-maligned occupation by the middle class and by the factory class. The industrial revolution and World War I lured many female domestics into factory work or nursing jobs. At the same time, the advent of the automobile replaced the positions of four coachmen and several stable boys with that of just one chauffeur. Chauffeurs, Lethbridge notes, were much more likely to come from engineering or mechanical backgrounds than from career service – yet another threat to the established order. Despite my interest in the subject matter, the sheer amount of information – and the organizational style of this book – have left me feeling inundated. I keep longing for chronological, rather than topical, order. Lethbridge routinely juxtaposes servant and employer anecdotes from disparate decades to support the topic at hand, but so many societal, technological and historical shifts were occurring in the time covered that it can be jarring to read a source from the 1880s, then suddenly one from the 1930s. Perhaps readers less attached to historical chronology will forgive Lethbridge her strategy. The journalist in me pays the author homage for this difficult undertaking. She has assembled a vast array of previously unpublished testimonials from servants and their descendants, adding to the rich cultural narrative of Britain’s below-stairs history. “Downton Abbey” fans won’t find characters like Thomas or O’Brien in this book, probably because everyone was too busy working 5 a.m. to midnight to stand around gossiping. But, readers also will find precious few facts that contradict the popular PBS TV show's historical underpinnings. If anything, I think having read this book will enhance my enjoyment of season 5 when it airs. Thanks, Lucy Lethbridge. You’ve done a good work.